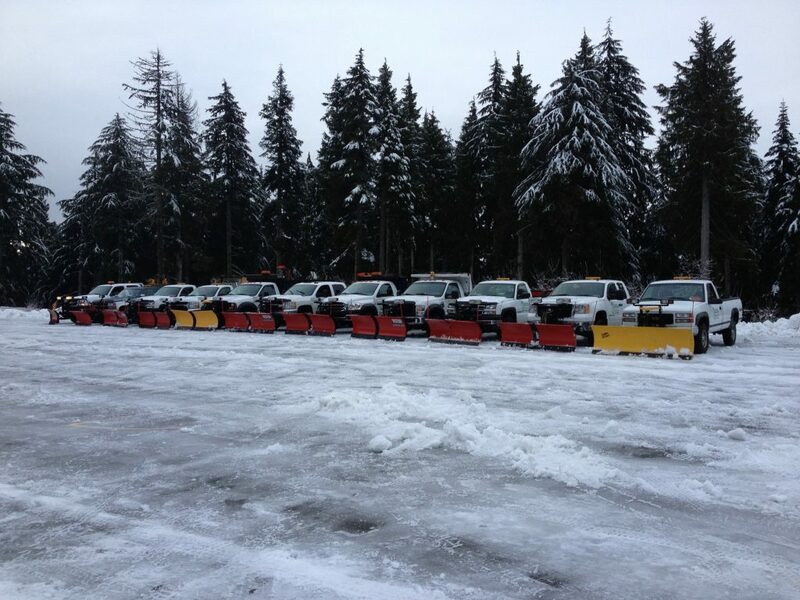 Snow and Ice Clearing and Management services can be customized to fit your level of need. We have the equipment for any strata or commercial client, while providing the best possible solution in the area. From a simple application of sidewalk ice melt product to broad scale motor grader plowing of streets & parking lots, we can provide the equipment and skilled teams to handle the challenges of winter weather. To help our customers and residents of the contracts we have, please read below some clarification of the contract, to help answer some F.A.Q many of you have or receive. I heard it referred to it as salting, I thought you used ice melter? When are we coming to apply ice melter? Why do you apply ice melter before it snows? Why do you apply ice melter after a plow? When are we coming to plow? Should I call even though we are “Automatic”? We want to be plowed by 6 am, can you arrange this each time it snows? through and pushed a furrow of snow on my clean driveway! what do we do about those to avoid damage? Our complex has rubber speed bumps, what about those? What about our sidewalk clearance and salting? Which areas do the sidewalks crew cover? We use only ice melter that is environmentally friendly, and non-toxic. We do not use salt. The term “salting” is just a term to use for the process of application. If you have signed onto our “AUTOMATIC” de-ice, we apply ice-melter to the roadways when there is snow forecasted, or roads are wet and freezing temperatures are predicted. We note areas of incline and difficult to plow parking ramps, and apply a heavier application to those areas and on any noted hazards. We cannot apply ice melter when there is precipitation (rain or snow) present or if rain is forecasted. Those contracts designated “CALL OUT” will need to call into either Victoria or Desmond to dispatch an application if they note freezing conditions on their roadways or would like an application prior to snowfall. Ice melter, when applied prior to snowfall in dry conditions, greatly improves plowing quality as it will provide a layer that prevents snow from freezing to the ground, thus giving the plow a better opportunity to scrape clean to the concrete. Occasionally, in situations where rain turns to snow, we are unable to apply ice melter prior to snowfall. For all our clients, for liability purposes we apply ice melter after each plowing unless temperature is above freezing and forecasted to remain so. Occasionally, due to melting snow washing away the ice melter, reapplication will be necessary if freezing temperatures are predicted, and any sites on the “AUTOMATIC ” De-Ice List will be applied. We generally do not plow until depths reach a minimum of three inches, unless otherwise directed. “AUTOMATIC” does not mean that as soon as the depth reaches 3 inches, we automatically appear instantly within 1 hour. We have trucks stationed all over with designated coverage areas, but there are still many factors that can impact our response time, like traffic and driving conditions, and depth of snow on sites increasing plow times. Due to regional snow intensity, an area may be hit harder than others with minimal snowfall. In this case, we may draw support from plowing trucks from those regions not affected as much to assist in the clearing efforts in these heavier hit areas. If we receive reports that intensity has increased in the lighter areas, we redirect the trucks from those heavier hit areas back to clear their designated sites. We monitor weather conditions on a 24/7 basis, but sometimes due to quick changes in conditions and inaccuracies of weather apps, we will occasionally call you to check conditions in your area. You are more than welcome to call/text us to let us know if conditions have worsened in your area or if accumulations have reached 3 inches. If you are on AUTOMATIC, rest assured, your site will be plowed if coverage is over 3 inches and we will get there as soon as possible. Please understand, we cannot book plow times, nor give exact ETA due to the reasons stated above. We also go back and check the plowed sites road conditions later that day or the next day to assess whether further clean up, or ice melter is required. ***Please note: if you call us off from coming to your site during a snowfall, we cannot guarantee response time back to the site. We do not provide any guarantee as to site arrival time as it is always a function of the amount of snowfall, time of snowfall, public road conditions and traffic (rush hour weekday or weekend). Nobody in the industry provides a guarantee as to site arrival time other than contractors looking after shopping centers but they keep equipment on site and charge the owners a monthly standby fee during the winter months. Most of our plows are v-plows have the ability to “scoop” while they are clearing roadways adjacent driveways, which eliminates a lot of snow furrows. However, we still can only get as close as it is safe, and due to accumulation levels, there may be some unavoidable spill-over. 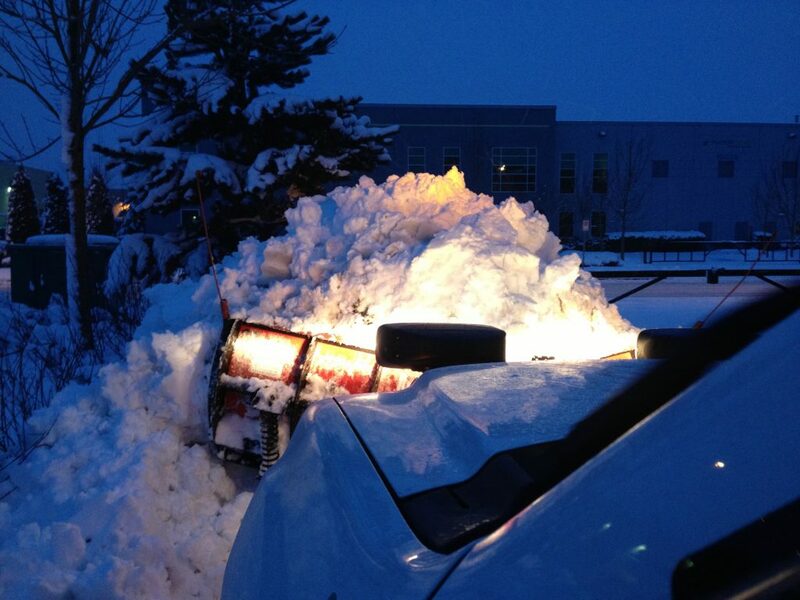 Although we take the utmost care during all snow-clearing procedures, extruded curbs or protruding fixtures hidden beneath snow easily break and crack with the slightest of contact by snow-clearing equipment. As such, we are not responsible for repairs of such items not clearly marked with flags or fluorescent poles. Any damages to lawn areas or gardens will be repaired at no additional cost by April 15th. Composite rubber speed bumps must be removed by the residents/owners prior to the winter as we cannot be responsible as they lift off easily due to the nature of the hardware holding them in place. Please contact us if you require a quote for removal prior to winter and reinstallation after winter. Due to the labor intensive nature of sidewalk clearing, we are only able to provide sidewalk shoveling service to our regular 12 month landscape maintenance contract accounts for which we provide one clearing per week as part of landscape services with any ice melter or labor in addition to one clearing per week billed out as per attached rate sheet with our contract. This service will be provided after a snowfall event and may or may not occur on a regular maintenance day and will be counted in lieu of their weekly service visit due to limitations of what can be services can be performed with snow or freezing conditions. Our crews cover common area sidewalks and stairs. This includes Boulevard sidewalks (to the gate), clubhouse or mail areas, and any interior common ground pathways and stairs. Due to the nature of gravel, we cannot scrape any gravel pathways/stairs clear. It is the resident’s responsibility to clear their driveways and any pathways to their doors. Please note our drivers/crews work long hard hours during snowfalls and generally forgo breaks to be on your site in an expeditious manner as possible. Your understanding is very much appreciated when drivers/crews have to take a quick meal break or to have to take time to pass over trucks to a relief driver. We are grateful for your patience and truly appreciate a wave, a smile, or an offer of a hot beverage!